During our childhood days, very rarely we used to get bakery food at home. We loved chocolates and bakery food more than anything else which was prepared at home :) Couple of years later, my mother mother learned preparing cake using pressure cooker. Then, she started preparing cake whenever we want! Especially, we loved the cake prepared using different colors :D She tried adding different flavors and dry fruits in her next experiments. Even now, we prepare the same cake with slight variations. This cake can be prepared very easily using pressure cooker. This time, I have prepared it using oven since I didn't had a wide vessel to fit in the pressure cooker. It came out very well in oven also! The only difference you can observe is when you use pressure cooker, base of the cake will become slightly dark in color; whereas base color won't change when oven is used. Sieve all purpose flour and baking powder 1 - 2 times. To this, add powdered sugar and milk powder and mix it well. 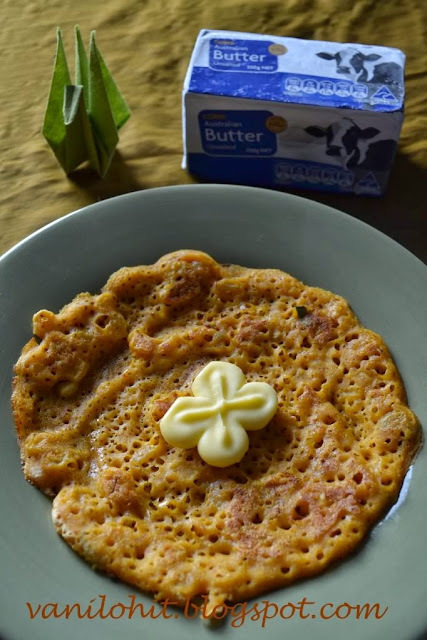 Melt the butter in a wok and pour it on the flour mixture and mix it nicely with your hands. Now, add milk little by little and prepare the cake batter. 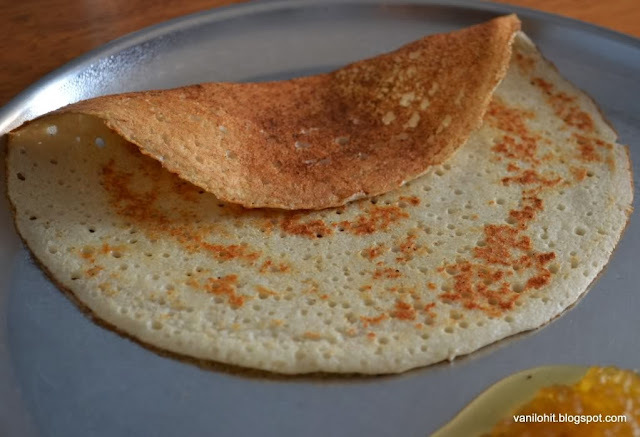 No need to add the whole quantity of milk; add it till you get the dosa batter consistency. One main tip here is to mix the batter in only one direction. Don't mix the batter in different directions. Finally, add cooking soda and vanilla essence or cinnamon powder and mix it without lumps. Transfer the batter to the greased baking pan and add some dry fruits, if you wish. Transfer the cake batter to a wide pan which will fit in the pressure cooker. Heat the pressure cooker (without closing the lid) without adding any water.Put the pan inside the cooker and close the lid. Don't put the weight on the lid, just close it with a steel cup. Keep it on simmer and cook it for around 40 - 45 minutes. Since we cook it on low flame, cooker won't get burnt. As we didn't put the weight, anytime we can open the lid to check whether its cooked. After cooking it for 30 - 35 minutes, just open the cooker lid and insert a knife into the cake. If the batter won't stick to the knife, its the sign that the cake is cooked. Transfer the cake batter to a greased baking pan. Preheat the oven to 350 F and cook the cake for about 50 - 55 minutes. After cooking it for 40 minutes, keep checking it for every five minutes. Allow the cake to get completely cool. Then, remove it carefully from the baking pan. Apply the icing after the cake cools down completely; otherwise it will melt. I have done the icing with cocoa powder for this cake. Mix butter and cocoa powder with sugar powder for taste and beat it nicely. Apply it to the cake and delicious cake is ready to eat! You can substitute cocoa powder with horlicks, winner or any other powder with chocolate flavor for icing. 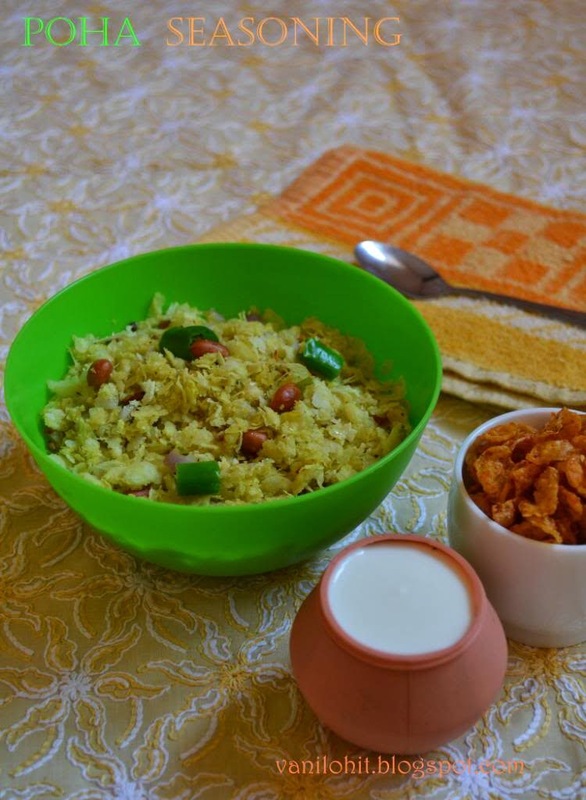 This poha is a perfect snacks for evening time with a cup of hot tea or coffee. Cut the green chilli into medium size pieces; chop the onion finely. Transfer the poha to a mixing bowl. Add salt and sugar for taste. Heat oil in a wok. Add groundnuts, red chilli pieces, urad dal, mustard seeds, coriander seeds, turmeric, green chilli pieces and curry leaves. Once it starts spluttering, pour the seasoning on the poha. Add 1/4th cup of water to the wok to clean it and sprinkle the same on the poha. 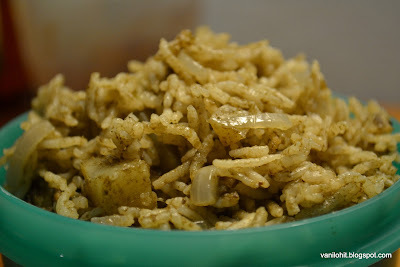 Also add grated coconut and chopped onion to the poha and mix it nicely with your hands. Add little more water, if needed. Don't add too much water, otherwise poha will become mushy mushy. Check the taste and add salt or sugar, if needed. 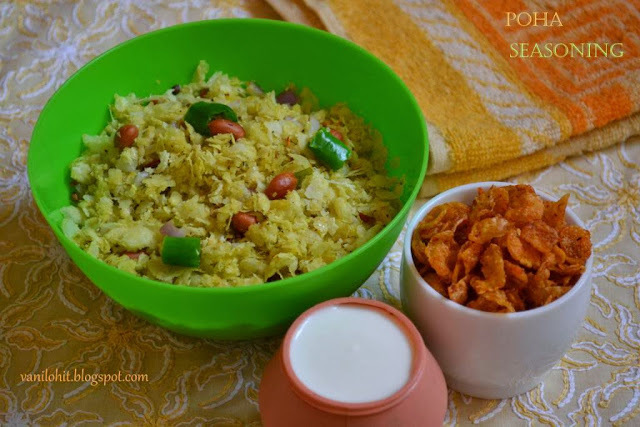 Serve this poha seasoning along with some spicy snacks. Some people love to have it with curd also! This is one of the rice variety which I usually prepare for hubby's lunch box. Recipe is also very simple, and it won't take much time to prepare. 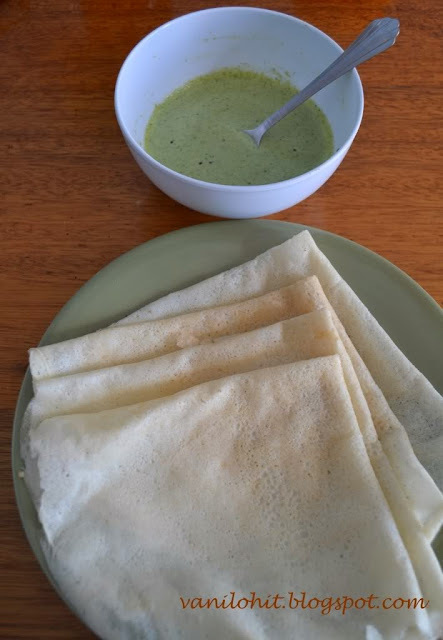 If you have no time to prepare a side dish or raita, simply it can be had with plain curd also! Normally, mint leaves will get spoiled within very few days even if you keep them in the fridge. I want to share a nice tip with you to avoid the spoiling! Clean the mint leaves and grind them in a blender along with little salt into fine paste. Add little water, if needed. Then, transfer the paste into a glass bottle and refrigerate it. It will last for at-least a month or more :) I will use this paste for chaat items, chutney, rice items, etc. Peel the potato and cut into small cubes. Soak it in water to avoid becoming oxidized. Chop the onion thinly lengthwise. Grind the grated coconut, ginger, garlic, mint leaves and green chillies fine paste. Heat oil in a thick bottom pan and add the cinnamon pieces, cloves and cardamom. Roast them for few seconds and add the chopped onion. Fry the onion on low flame till it becomes brownish. Then, add the ground paste and potato cubes. Saute it for 3 - 4 minutes until the raw smell is gone. To this, add the washed rice and saute it for 1 - 2 minutes. Now, add required amount of water, salt and lime squeeze. 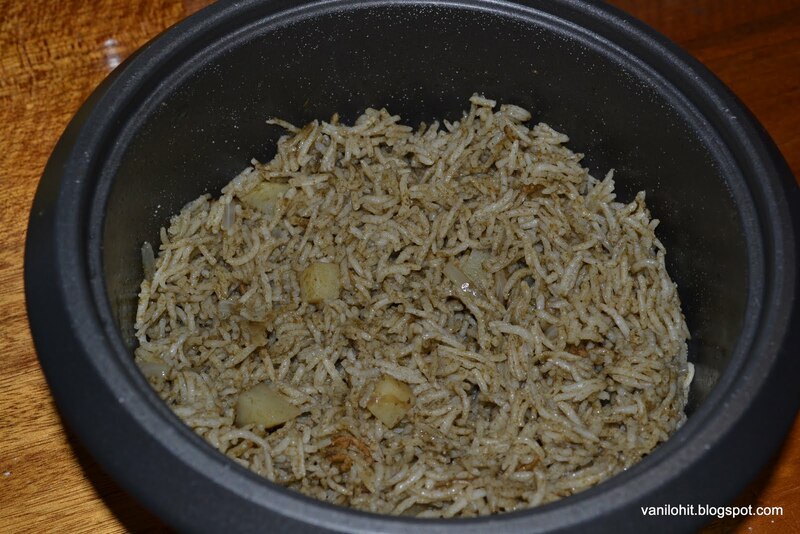 Transfer the mixture to rice cooker / pressure cooker and and cook them. 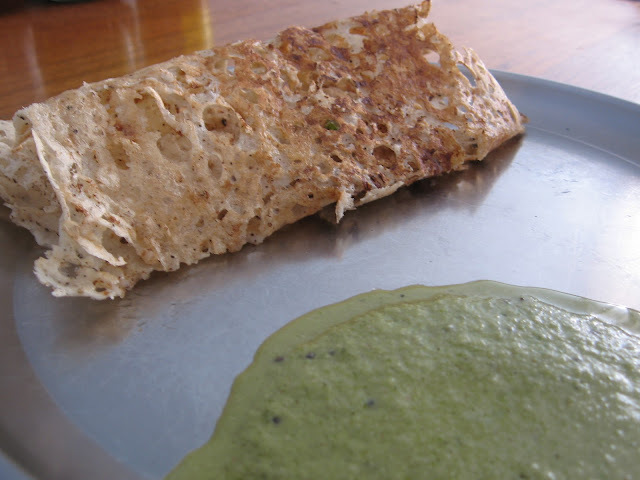 Serve it hot with raita or simply curd! If you have used more water while grinding the paste, add little less water while cooking. Adjust the quantity of water according to the rice which you are using. Don't make it too mushy. 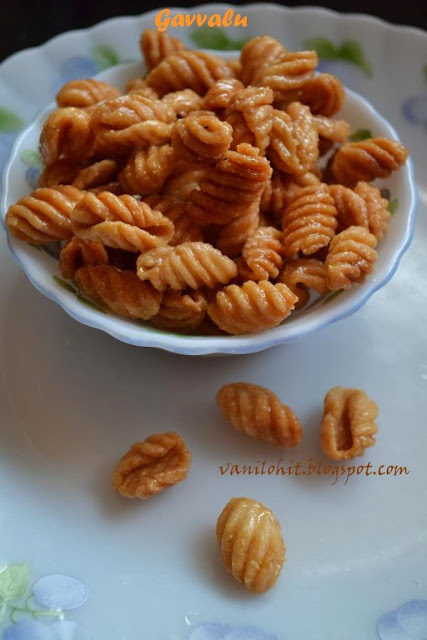 For garnishing, you can use some cashew pieces roasted with little oil. 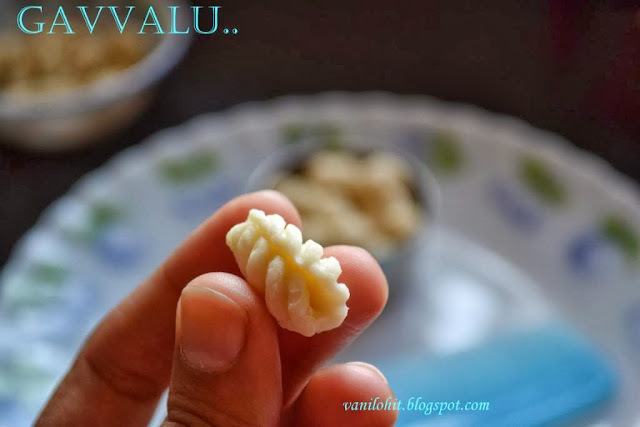 Gavvalu is a famous snack item from Andhra. Few months back, one of my Andhra friends offered these lovely goodies to us. We were wondering about the shape of these goodies! They look alike small shells and tastes very nice.Then, she told me the recipe of these sweet shells. But there was a small confusion. She told that she had used the Gavvalu board, a small board with zig zag surface to give that shape to the Gavvalu. Then, I searched in Google for an alternative for the Gavvalu Board. I ended up with two easy alternatives which are - a fork or a big comb! I tried with both, but for giving a nice shape, I felt the comb better than fork. 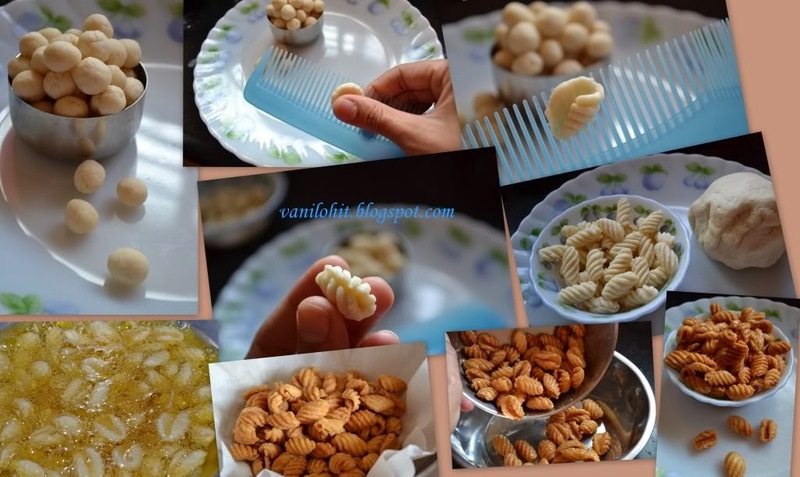 These days, I am maintaining a separate comb in the kitchen exclusively for Gavvalu preparation! 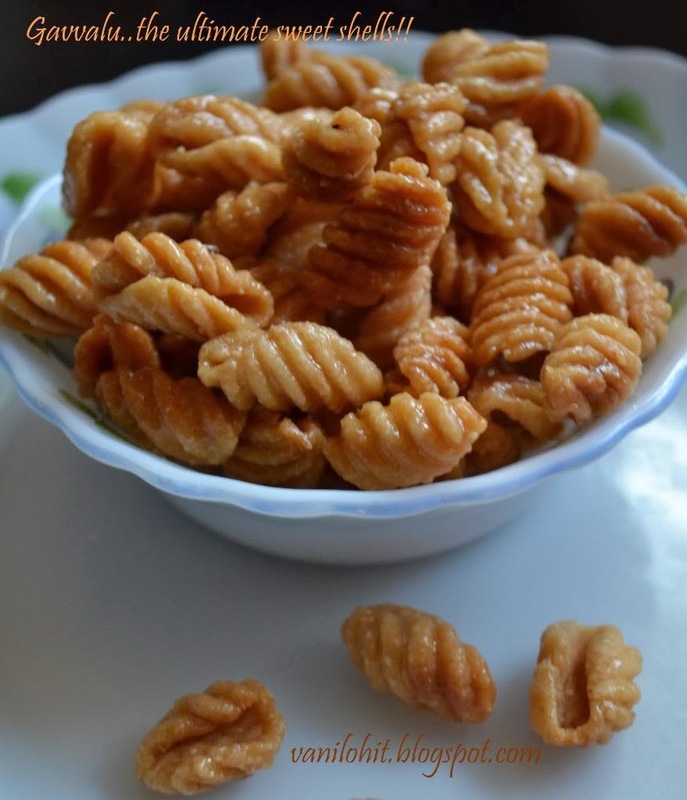 These sweet shells goes well with a cup of hot tea or coffee. Or simply you can eat them anytime (like me??) :) Be cautious a bit while eating Gavvalu..coz you can't stop munching them!! Mix all purpose flour, rava, salt and ghee in a mixing bowl. Add water little by little and prepare a non - sticky dough. Dough should not be too soft, nor too hard. Cover the dough with a lid or a wet cloth and leave it for 20 minutes. Then, take a lemon size dough and prepare small balls out of it. Gently press each ball on the comb (or Gavvalu Board) as shown in the picture. Keep the designed surface out and carefully roll the Gavvalu little bit to give the Shell shape. Heat oil in a heavy pan and deep fry the prepared Gavvalu in batches on medium or low heat for around five minutes. Once the Gavvalu becomes crispy and golden brown, drain the oil and transfer them onto a tissue paper to absorb the excess oil. In the meanwhile, combine sugar and water and prepare a thick syrup (may be 2 1/2 thread consistency). Add pinch of cardamom powder and keep it aside. 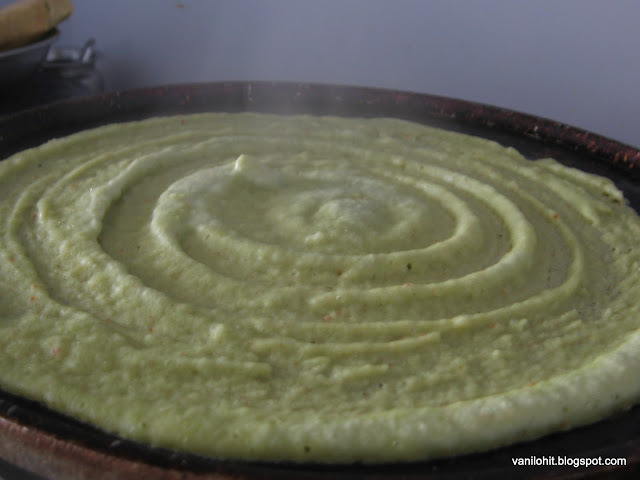 Transfer the deep fried Gavvalu to a mixing bowl. Pour 3 - 4 spoons of sugar syrup and mix it thoroughly. Adjust the quantity of sugar syrup according to your taste. Spread the sugar coated shells on a plate for 2 minutes to get dried up. Once they are dried up, they won't be sticky anymore. Enjoy the sweet shells with a cup of tea / coffee! 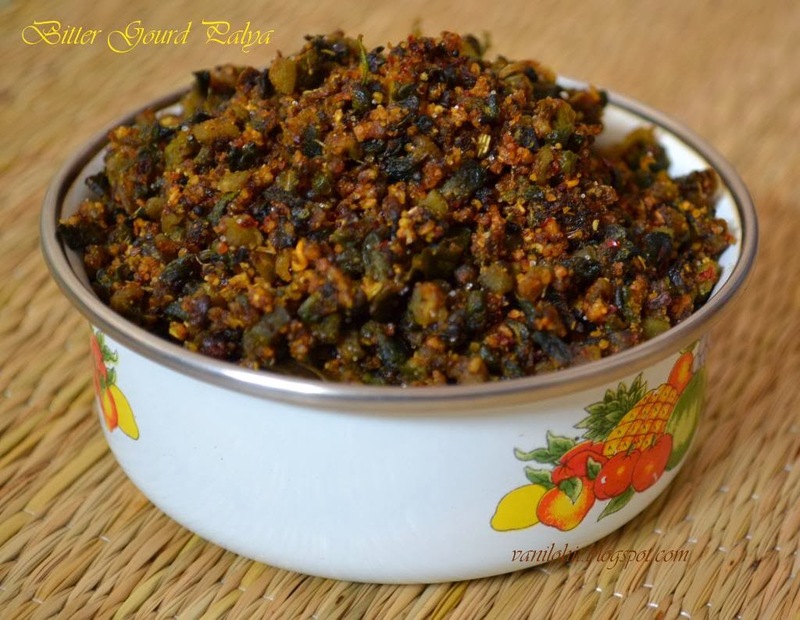 For giving a crispy touch, I have added sooji rava here. I have got very good results with chiroti rava also. 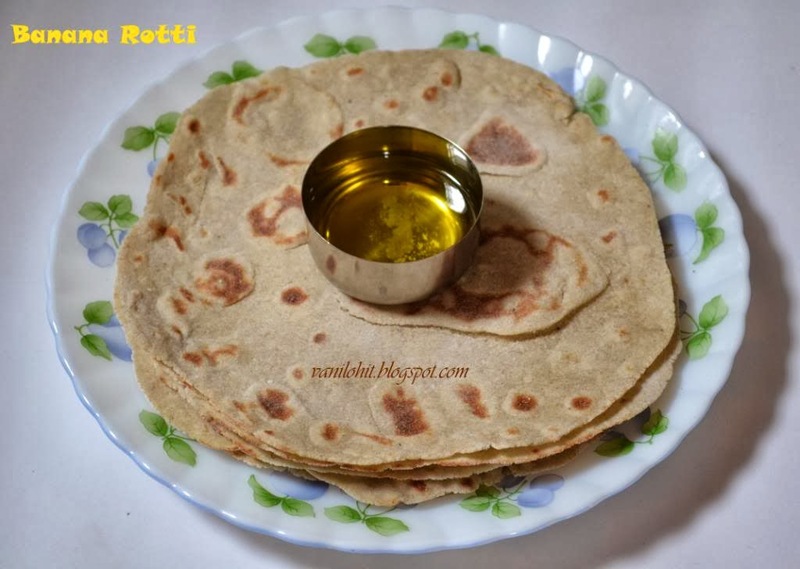 If you wish to use chiroti rava, you can add 2 spoons of sooji rava along with chiroti rava. If the dough has become too soft and you are not able to give a nice shape to the Gavvalu, try adding little more sooji rava to the dough. Keep the dough closed to avoid becoming dry. 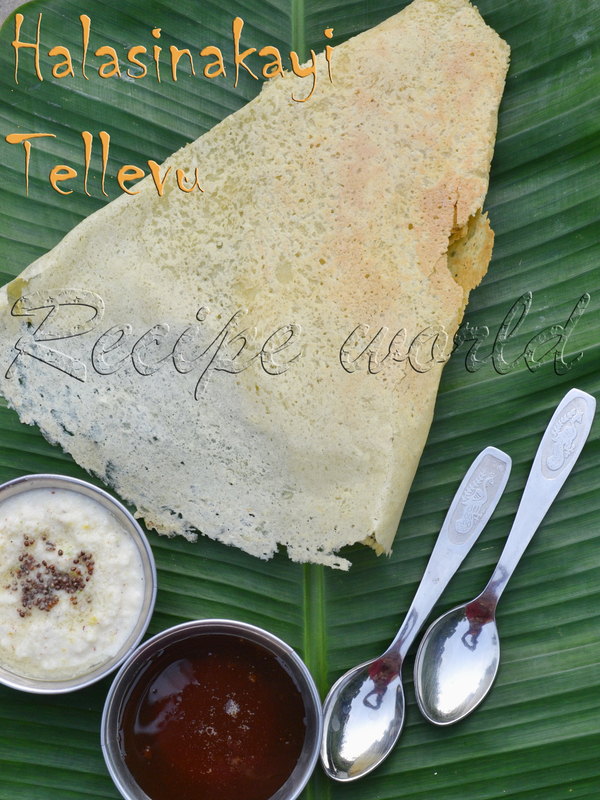 This Palya recipe is from one of my relatives in Bangalore. My mom does it in a different way, but I prefer this kind of palya most of the times! This palya tastes very good and you won't feel the bitterness anytime. Since it is roasted nicely, it can be used up to 10 - 12 days. Cut and remove the seeds from bitter gourd and chop them finely. Add 3 - 4 spoons of salt and 1/2 spoon of turmeric powder and mix it well and keep it closed for 30 minutes. Squeeze off all the water content from the chopped bitter gourd using your hands. Take a wide bottom pan for frying. Heat the oil, add red chilli pieces, urad dal, mustard seeds, turmeric, green chillies and curry leaves. After the seasoning is roasted nicely, add chopped bitter gourd, salt, amchur powder, jaggery and mix well. Saute it occasionally and fry on low flame for about 45 minutes. In the meanwhile, keep the Masala Powder ready: Roast the above mentioned ingredients for Masala Powder using little oil and make a coarse powder. Once the bitter gourd is roasted nicely and looks bit dry, add the masala powder and saute it well. Fry it for 4 - 5 minutes and switch off the flame. Now, Bitter gourd palys is ready to accompany your meals! 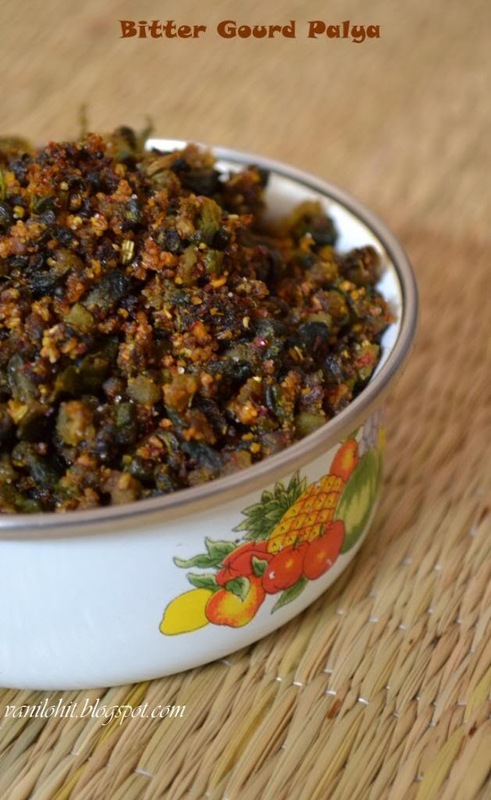 To remove the bitterness of bitter gourd, mix the chopped bitter gourd with salt and turmeric and keep it for half an hour. Then, squeeze off all the water from bitter gourd by pressing with your hands. Then, use it for cooking. 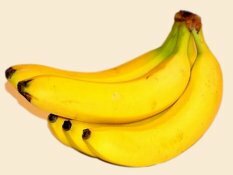 Peel and chop the bananas into medium size pieces. Grind them in mixer and prepare a fine paste. Add salt, sugar, jaggery and water to the banana paste and boil it for 2 minutes. Then, add the flours and saute it for 2 minutes so that the dough gets cooked well. Once you get the right consistency to prepare the balls, switch off the flame and close the dough with a lid. After the dough is completely cool, prepare lemon size balls from the dough and roll them thinly using some dry flour. 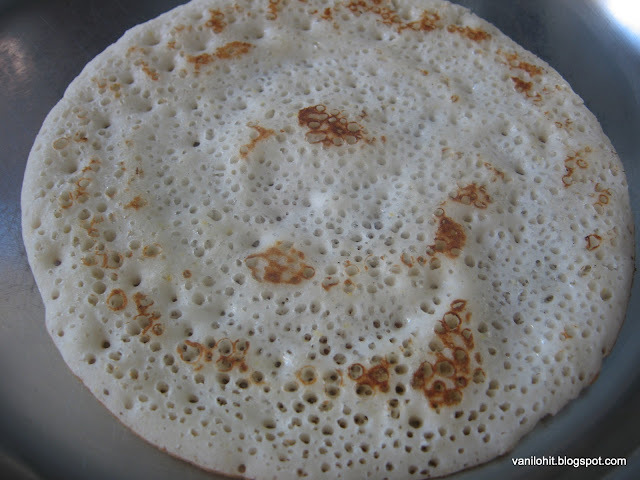 Transfer the rotti onto the hot skillet and cook both the sides nicely. Serve the hot rotti along with ghee! 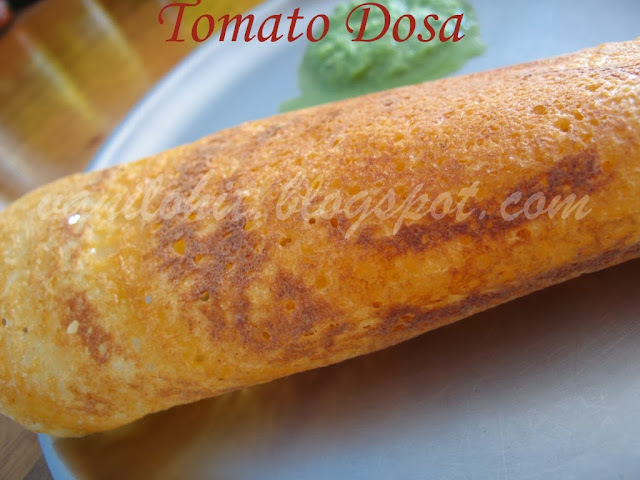 If you are planning this rotti for the breakfast, you can prepare the dough previous night itself. We had a mixer grinder of Butterfly brand from past 3 years. My sister has been using this brand mixer from around 10 years. She suggested me this brand after my marriage. I was happy with the mixer and loved the juice jar which comes along with it! Due to our luggage limit, we sold it in Australia while relocating to India. After coming to Bangalore, I wanted to buy the same model from butterfly again! We searched and searched here, nowhere I could find the same kind of mixer :( Most of the big and branded shops won't have the Butterfly mixer these days and very few shops have some other model in Butterfly. Finally, I was able to get the same model mixer in a small shop and without a second thought, we bought it from them!! Now I have decided not to loose this mixer for any reason for at-least a couple of years. We had been to our native recently. One of our relatives had brought some home grown Amatekayi (Ambatekayi) for us. Since we can't get all these village veggies and fruits here, our bags will be heavily loaded with these items while coming back from the native :) Amatekayi (Ambatekayi) is a kind of tangy fruit which is common in rural areas. It will have a hard skin and a fibrous seed inside. 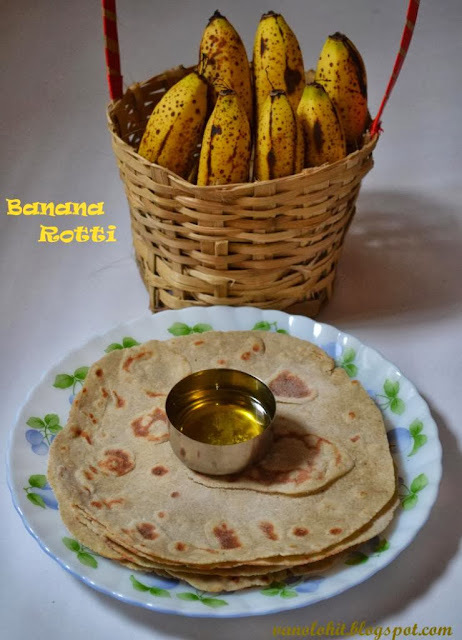 Lot of delicious recipes can be prepared using this Amatekayi. 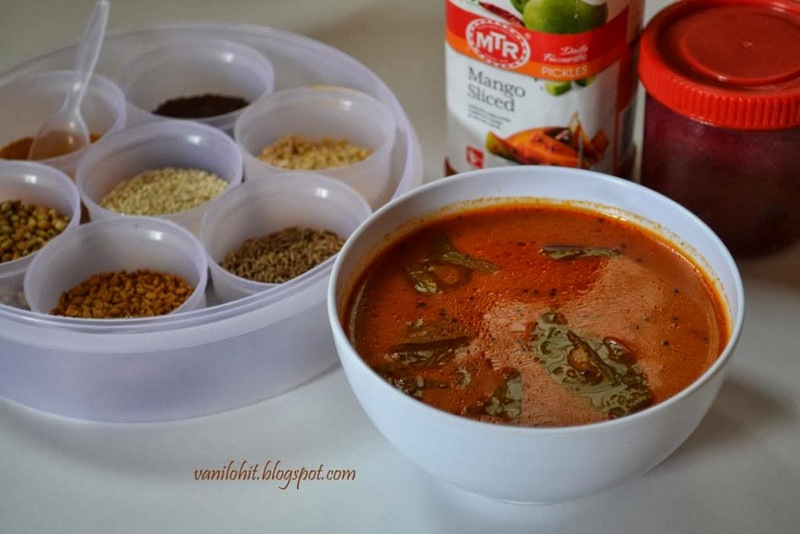 Here is the recipe of sambar using this Amatekayi. This sambar is called as 'Amati' in my place. This sambar will have a spicy, tangy and sweetish taste and goes well with rice! Take 3 cups of water in a vessel and cook the Amatekayi till soft. Once the cooked Amatekayi is cool, add salt and sugar. Squeeze off the Amatekayi in that mixture and let the skin and seed remain in the gravy. Heat 2 spoons of oil in a small wok and add cloves, red chillies, coriander seeds and mustard seeds. Roast them until you hear the spluttering sound and grind them finely along with grated coconut. Heat oil in a heavy bottom pan, add urad dal, mustard seeds, asafoetida and curry leaves. Add the cooked Amatekayi gravy to the seasoning and boil it for 4 - 5 minutes. 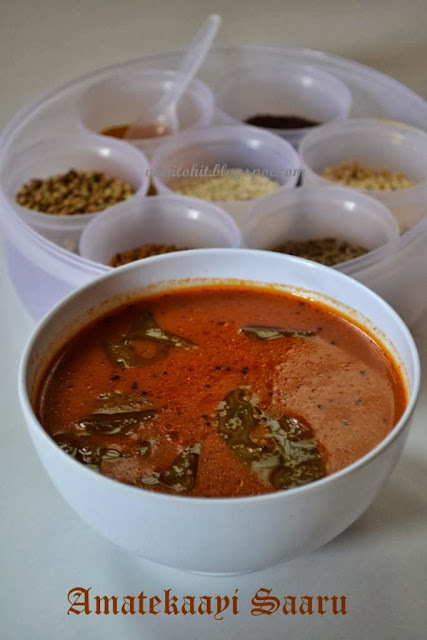 Sambar (Amati) is ready to serve with hot rice! It can be preserved upto a week in refrigerator. Wash the rice thoroughly and cook with 1:2 cups of water. Mix long cut carrot, beans and green peas with little salt in a pressure cooker for one whistle. Let it cool and drain all the water. Heat oil in a pan and add cinnamon pieces, cloves, mustard seeds and fry for a while. Add cumin seeds, fennel seeds, sliced green chilli, ginger garlic paste and saute for a minute. Now add thinly sliced onion and fry for 3-4 minutes. Add sambar/rasam powder and cooked vegetables into the pan and cook for 2 minutes. Then add cooked rice, salt , lime juice and sugar and mix well. Finally add ghee and cover the pan, simmer for 4 minutes. Now your pulav is ready!! It's tastier if you eat hot with raitha.